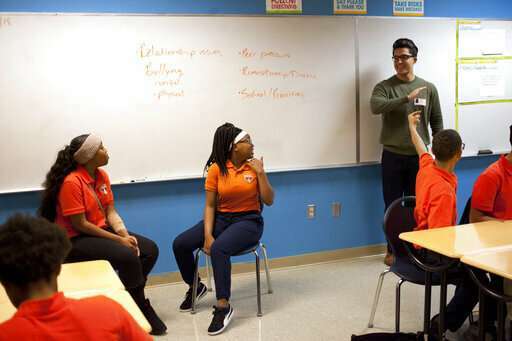 In a scenario playing out in more and more classrooms around the world, a Dallas teenager recently asked her classmate if anything was wrong, noting that she hadn't been acting like herself. The brusque reply: "Just leave me alone." 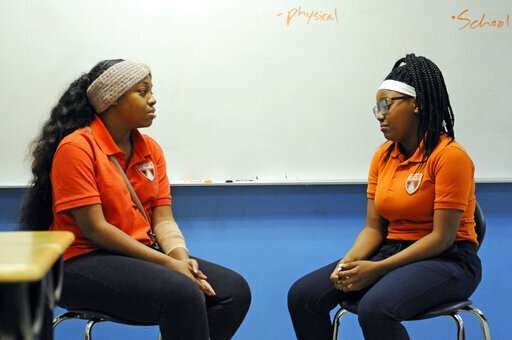 The ninth-graders at the Uplift Hampton Preparatory school were role-playing as part of a program that aims to teach teens how to spot the signs of depression in themselves and others. Suicide is the second leading cause of death among Americans ages 10 to 18, according to government health statistics, and experts hope the lessons will get help to depressed teens more quickly. "It's kind of like 'Mental Health 101.' 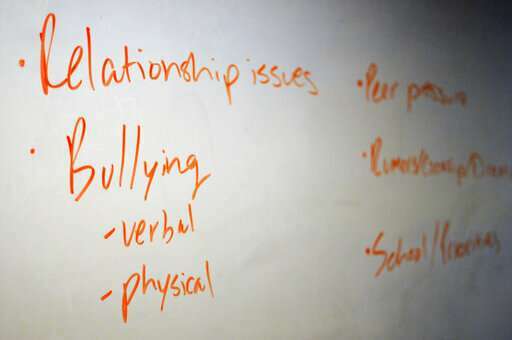 So they talk about depression and anxiety and just common mental health issues, and then I think the most important thing is they talk about what to do if you feel that way," said Tony Walker, senior director of student support services at Uplift Education, which offers the program to all ninth-graders at its network of Dallas-area public charter schools, including Uplift Hampton. The University of Texas Southwestern Medical Center is administering the program, which is called Youth Aware of Mental Health, or YAM, and was developed by researchers at Karolinska Institute in Stockholm and Columbia University in New York. 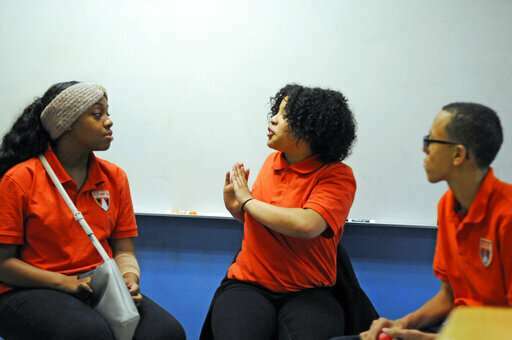 UT Southwestern researcher Marshall Motsenbocker, who led the program's five 45-minute sessions at Uplift Hampton, said role-playing helps teens talk through difficult issues. When the two girls finished their recent scene, he asked the class what signs of depression they recognized and what might be causing it. He said teens are sometimes too quick to act, and these discussions help them pause to think about what might have motivated someone to behave a certain way. Destinie Medina, who participated in the sessions at Uplift Hampton, said it's important to know how to help someone who has depression or suicidal thoughts. She said she also learned "what might cause depression, like what's the difference between depression and sadness." Classmate Jose Perales said he learned that sometimes helping means "you just have to listen to what they have to say and how they feel." Research on the program has shown encouraging results. A study published in the medical journal Lancet in 2015 found that it reduced the number of suicide attempts and severe suicidal thoughts of those who went through it. Interest in the program has increased since then, with some schools in Sweden, Australia, India, England and the U.S. now offering it, said Camilla Wasserman, a Karolinska Institute researcher who helped create the program. She said one of its strengths is that it encourages discussion. "We don't really believe in right or wrong answers and we explore all types of situations," Wasserman said. This is the third year UT Southwestern has offered the program. It's reached more than 18,000 students in that time and is currently in more than 30 Dallas-area schools. Dr. Madhukar Trivedi, who oversees the program and conducts research on depression at the university, said assessments of students before and after completing the program shows they improve their knowledge of what to do when someone needs help and that their own symptoms of depression and anxiety decrease. Trivedi said that to allay any concerns that parents might have, including the "unfortunate misperception" that talking to teens about depression might make them depressed, parents are invited to an informational session. One area school district turned to the program two years ago after a string of suicides. "Our counselors have reported that they see a lot more students who come in concerned about their own health or someone else as a result of this program," said Jana Hancock, director of guidance and family education services for the Plano Independent School District. She noted that the program is designed for everyone—not just those who might be experiencing issues. 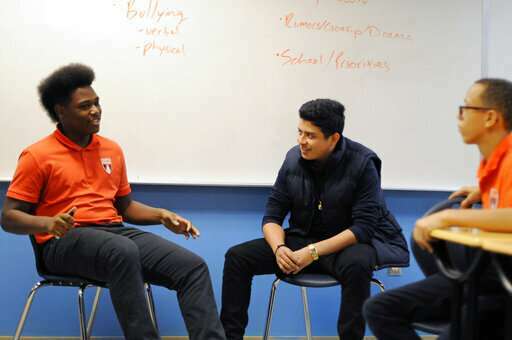 Youth Aware of Mental Health is just one of the programs used to teach teens about mental health. The National Alliance on Mental Illness created a 50-minute program called Ending the Silence that teaches students the warning signs of mental health problems. It has reached almost 450,000 kids in 41 states since the organization started offering it nationally in 2014, said Jennifer Rothman, the group's senior manager for youth and young adult initiatives. New York and Virginia, meanwhile, recently passed laws requiring such lessons. "It was an idea, frankly, whose time had come," said Glenn Liebman, CEO of the Mental Health Association in New York State, Inc., a mental health advocacy group that spent several years pushing for the legislation before it passed.